Driving hypnotic drums. Deep guttural chants. I wasn’t sure what I was listening to, but I was loving every sound and rhythm emanating from my sister’s CD player as we drove to our destination. When the chorus came on, I strained to make out the words. “Bullet?…Bullet The Blue Sky? What is this?!“. Knowing I was a viral U2 fan, she’d purposely popped in this CD. With a captivating rendition of my favorite U2 tune, “Mysterious Ways” by world renown Beninese songstress, Angelique Kidjo to the percussion laden version of “Bullet The Blue Sky” by Vieux Farka Touré from Mali, every track on this album keeps you guessing how each song transforms. 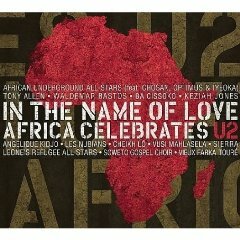 Africa Celebrates U2 is an excellent cross-section of U2 classics sung by an equally superb cross-section of pure African talents – from heavy sounds of brass in “Where the Streets Have No Name” sung by Nigerian-born Tony Allen, a former drummer for the Late Fela Kuti, to the softer remake of “Love Is Blindness” by Afro-pop musician, Waldemar Bastos from Angola. This album is very reminiscent of bands such as Afro Celt Sound System that fuse African ethnic sounds with pipes, flutes, and other Irish Celtic sounds. If you love the cross pollination of musical genres across various cultures or are just a viral U2 fan with an open mind, you’ll love this album. Needless to say, my sister was forced to part ways with her copy.